Advantages: All Fury versions covered in chronological text and pictures; assessment of available injection moulded models; excellent photos; close-up detail for walkaround subjects; ten colour profiles included. Disadvantages: No 1/72 scale line drawings in this volume. In addition to re-releasing some of the very popular and useful titles in the Detail and Scale's back-catalogue, Squadron Signal Publications are also releasing brand new volumes by Bert Kinsey. The latest of these is "FJ Fury in detail and scale". This is a very timely subject considering the recent release of the 1/48 scale kit from Grand Phoenix. This latest D&S title mostly follows the reliable formula of earlier releases. There are 79 pages between the soft covers, packed with information and photographs. 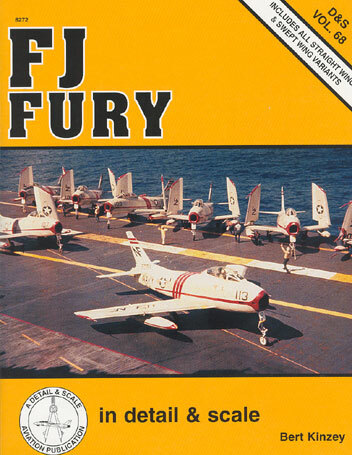 All the Fury variants are covered, from the straight wing FJ-1 through the swept-wing FJ-2, 3, 3M, 4 and 4b. A brief historical background on each variant is bolstered by many well captioned photos. Images are a combination of operational and museum walkarounds, with a detailed examination of the FJ-4 Fury at the National Museum of Naval Aviation. This will be especially helpful for modellers planning on building the Grand Phoenix kit in 1/48 scale. The jewel in the photographic crown, however, is the 14 pages of big, beautiful full-colour images. These are mostly photos of operational aircraft. Very nice indeed! The ten colour profiles across two pages are also very attractive. The regular analysis of scale models covers injection moulded releases in 1/72 and 1/48 scale. It is quite up to date, even including the Grand Phoenix kit. Although there are a number of exploded views and factory drawings, the familar constant 1/72 scale drawings are not present in this title. The FJ Fury family was a significant milestone for the US Navy, but reference for the type is hardly thick on the ground. The release of "FJ Fury in detail and scale" will be welcomed by modellers and aviation enthusiasts alike for its concise summary of variants and airframe details.